These days, Instagram is amongst one of the most used and popular social networking sites. People create an account and post photos and videos on various categories like food, photography, art & craft & a lot more. Therefore, many website owners wish to display their Instagram updates on their site as well. So, what can be done if you want to display these posts on your site or in some widgetized area? The answer to the question is Instagram jQuery plugins! All you gotta do is, install these plugins on your website and you will get an API via which you can automatically fetch the pictures and videos from various accounts, hashtags, location, etc. Then, you can easily select the photos you want to post on your site. Easy enough! These plugins are of great help as they save your time & energy by preventing you from searching & downloading pics from different accounts. Moreover, most of these plugins come bundled with a nicely written documentation & several demos for easy implementation. Therefore, we have created a list of 5+ Instagram jQuery Plugins and also discussed their major attributes, pricing plan and other details. Besides, you may also be enthralled by some of these blogs. So, do have a look! 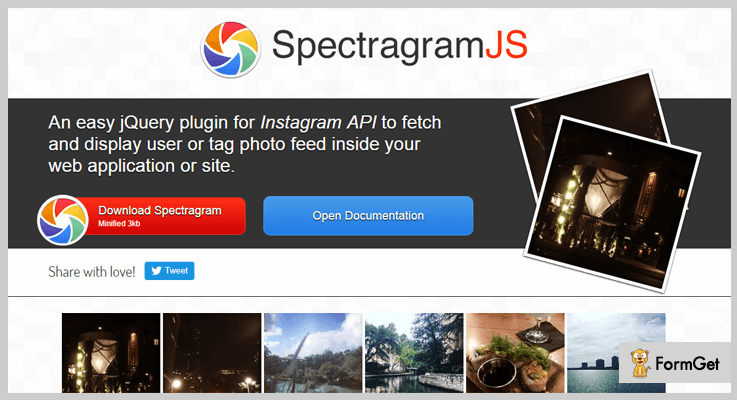 Let’s get started with Instagram jQuery Plugins. This is one of the finest jQuery plugins. It is used for adding the images or videos from an Instagram feed to your website in the form of grid or slider. It provides various features like easy customization options for the post & pop-up elements & much more. Besides, they also facilitate 10 predefined color schemes, custom colors of 13 UI elements. Along with this, they also provide two browsing directions like horizontal or vertical. You can install the plugin on any website by simply copying & pasting the widget script. Plus, it is retina ready & responsive to all screens. It also provides multilingual support. You can buy this plugin at the cost of $22. Along with this plugin, you get all of its features along with the benefit of all future updates & prior support. It provides you 3 different navigation controls of an Instagram gallery like arrows, scroll & drag. You can apply animation effects such as fade or slide, adjust its speed & select animation easing of slide switching. This plugin empowers you to add & filter the photos on the basis of username, hashtags, locations & URL of specific photos. By using ‘except’ filter you can restrict certain content or photos from specified hashtags, location, etc. Along with this, you can also define breakpoints for rows, columns & gutter in the grid depending on the width of the window. Instagram Plugin enables you to add the images from various Instagram accounts to your website. This plugin provides you commendable features like capability to hide the header, smooth scrolling, etc. It includes the profile info like a profile picture, images, followers following number & supports the high-resolution image in 4 different sizes. You can easily customize this plugin using HTML or CSS. Moreover, this plugin is easy to install, supports multiple languages & comes along with a well documented JS code. The price of this plugin is $17. Additionally, you also get the benefit of updates and support for 6-months which can be extended for another year by paying $5.63. You can add the pictures from any username, hashtag or username filtered by hashtags to your website & exclude them as well. It enables you to add a button which directs to the Instagram page. This plugin automatically adjusts the images to the size of slider widget. Along with this, you can choose the colors for background, panel, button & text. Moreso, it also provides beautiful & fast loading animations & images cache too. It is a renowned jQuery plugin which simplifies the task of sharing photos from Instagram to your website. This plugin provides you with various flexibility features like animations, transitions and much more. Either you can pull as many photos and HD videos you like or, you can also set a limit to this functionality. Furthermore, this plugin provides multi-layered design & effects plus, it is based on non-conflicting plugin design. This plugin is available at two different rates. For availing the standard license, you have to pay $9. To get the extended license, you have to pay $45. Along with the product, you also get support for 6 months which can be extended for another year by paying the amount of $2.63 & $13.13 respectively. It provides you with various modes to pull the Instagram photos like popular, user & multi-user Instagram feed mode. Thereby, you can pull the photos from popular accounts, specific account or multiple accounts as per the mode you select. By using tag mode, you can specify the hashtags to search from Instagram API. This plugin grants you various options to customize the gallery controls like animation, transitions, speed, easing etc. You can set a limit on the number of photos you want to upload on your site. This is an efficient jQuery plugin. It provides several for uploading the photos from Instagram page to your website like upload a pic from your account or any other account and a lot more. Simple Instagram Fancybox is a flexible plugin i.e. you can easily customize it as you want. On top of that, it is compatible with almost all modern browsers like IE 6 – IE 11, Safari, Firefox, Opera, Chrome, etc. You can add pictures from any account just by inserting the username. It provides you with special effects and animations. This plugin is very lightweight which makes it load faster. Along with this, you also get a nicely-written documentation which you can refer in case of doubt. jQuery Instagram Browser is an excellent plugin. With the help of this plugin, you can fetch the photos & videos from the Instagram feed and post it on your website. Further, it is cross-browser compatible and comes bundled with a documentation. So, you don’t have to hassle much and simply refer to queries and implement thereby. You can avail this plugin at two different rates. Moreover, you also get all future updates and 6-month support along with this plugin. To extend the support for another year you have to pay $1.13 & $5.63 respectively for both the versions. To avail the regular license of this plugin, you have to pay $5. For availing an extended version of this plugin, you have t pay $25. It enables you to search the Instagram API with just a username and a list of users will be displayed. Hence, you can select the username and view the photos. You can also search the Instagram photos by using hashtags. Although this plugin shows 20 profiles or photos at a time, you can also view more by adding the load more option. This plugin provides a hover tooltip which triggers on mouseover a photo & displays an info tooltip showing username, date, timestamp, comments, and the number of likes. With the help of this freemium plugin, you can easily post the photos from Instagram feed to your website. This plugin is very flexible and easy to use. It is very lightweight and as a result, loads faster. You can acquire this plugin without spending a single penny. Simply go to ‘github.com’ and download it for free. You can get the most recent post from the Instagram API by inserting the username. It allows you to define the HTML tag for displaying the results like in the form of lists, etc. This plugin empowers you to define the size of the image such as small, medium & large. Apart from this, you can also use your own Access token. 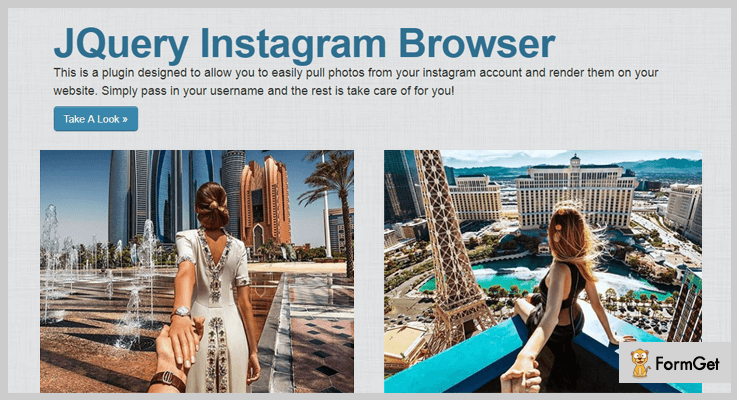 We have mentioned few of the very well known Instagram jQuery plugins which will help you to add photos to your website from the Instagram account. They enable you to fetch the pictures & resize them simultaneously. Also, you can add pics and videos from multiple accounts, tags, etc. So, we hope you might have found the plugin which fits best in the box of your requirement. Feel free to contact us for any more queries and suggestion. We will get back to you as early as possible.